These short-term detection tubes are for measuring Phosgene gas (0.02/a). 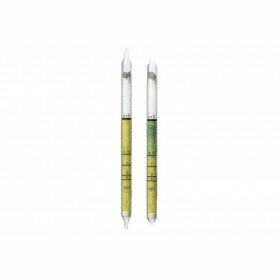 They have a measurement range of 0.5 to 4.5 ppm and come in a pack of 10 tubes. They have a shelf life 2 years and can detect a range of substances including 4-Chlorobutrylchloride. Chlorine and hydrochloric acid lead to plus errors and, at higher concentrations, to bleaching of the indicating layer. Concentrations of phosgene above 30 ppm will also lead to bleaching of the indicating layer..
High concentrations of phosgene will be not indicated!